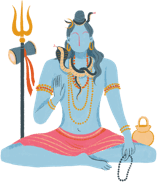 Hinduism: A Glossary of Sanskrit Words beginning with "N"
Nada is the Sanskrit word for "sound" or "tone." Many yogis believe that nada is the hidden energy that connects the outer and inner cosmos. This ancient Indian system follows a science of inner transformation through sound and tone. In traditional Indian medicine and spirituality, Nadis are said to be the channels, or nerves, through which the energies of the physical body, the subtle body, and the causal body are believed to flow. Literally, "I bow to you," the greeting which acknowledges the Atman in another person. A depiction of the Hindu god Shiva as the cosmic ecstatic dancer--as lord of the cosmic dance. A nine-day Hindu festival devoted to the goddess Durga. This multi-day Hindu festival is celebrated in the autumn every year. Literally, "not this, not this," the expression used to denote that Brahman is beyond all dualities and human thought. Translates as "Without form," referring to Brahman as Unmanifest. Translates as "Without gunas," without qualities, referring to Brahman as Unmanifest. Liberation, the state of peace. The literal translation is "blown out," referring to liberation from the samsaric cycle of birth, death, and rebirth. "Obligatory," referring to aspects of religious practice that are mandatory. These are related Hindu philosophies. In philosophical context, Nyaya encompasses propriety, logic, and method. The Vaisheshika school of Hinduism accepts only two reliable means to knowledge: perception and inference.